China Earthquake Administration reports "massive explosion"
An earthquake has been detected in North Korea triggering fears that Pyongyang has conducted another nuclear test. According to the China's Earthquake Administration the earthquake measured 6.3 magnitudeThe administration said there had been a massive explosion, suggesting that North Korea had carried out its sixth nuclear test. Another estimate said the earthquake was 5.2 magnitude. The authorities in Seoul also said they believed Kim Jong-un's regime may have performed a nuclear test. Only a few hours earlier North Korea has escalated tensions with a claim that it has developed a more advanced nuclear weapon with "great destructive power" capable of fitting on an intercontinental ballistic missile. The official North Korean news agency, KCNA, said the hydrogen bomb was inspected by Kim Jong-un. It was a "thermonuclear weapon with super explosive power made by our own efforts and technology", KCNA said, with the agency adding that "all components of the H-bomb were 100 percent domestically made". 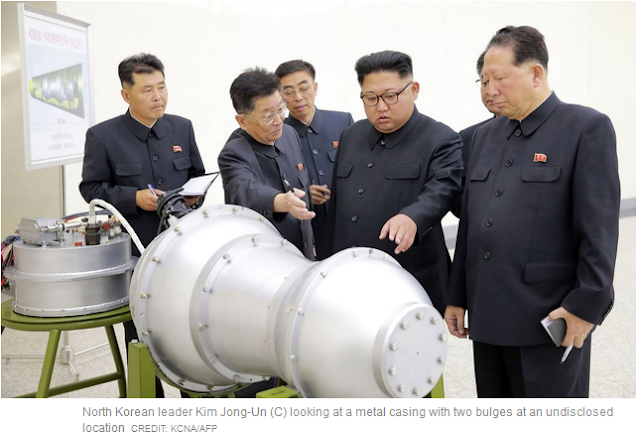 Some have questioned whether Pyongyang has a working H-bomb. But earlier this month, US intelligence is understood to have concluded that the rogue state has had produced a miniaturised nuclear warhead that could fit inside an ICBM. In January last year, Pyongyang boasted that it had carried out a successful underground test of a miniaturised hydrogen bomb. However western analysts dismissed the claims saying the six-kiloton yield was too low for a thermonuclear device. If North Korea's claims are true, the ability to mount a warhead on a missile would be seen as a significant escalation, creating a risk that it was preparing for an attack. The announcement came after a series of tests by the North Korean regime, including one which saw a missile fly over Japan. Earlier this month Pyongyang said it was "carefully examining" a plan to strike the US territory of Guam with missiles. Donald Trump warned that if the regime did so it would be met with "fire and fury like the world has never seen". At the same time the US has agreed to revise a treaty capping the development of South Korea's ballistic missiles. Following Pyongyang's announcement, Japanese Prime Minister Shinzo Abe spoke with Donald Trump by phone and said that in face of an "escalating" situation with North Korea that close cooperation between their countries, South Korea and China was needed. Julian Ryall reports from Tokyo. Shinzo Abe, the Japanese prime minister, told reporters in Tokyo on Sunday afternoon. Mr Abe has instructed government ministries to gather all available data on the test and provide the public with information on any developments that will impact citizens' safety. The test comes just five days after a North Korean intermediate-range ballistic missile flew over Japan before crashing into the Pacific Ocean. He added that Japan will work closely with the United States and South Korea to handle this latest provocation from North Korea. North Korea's nuclear test came just hours after Shinzo Abe, the Japanese prime minister, spoke on the phone with President Donald Trump, with the two leaders agreeing that they need to step up the pressure on Pyongyang to make the regime change its aggressive and destabilising behaviour. "We completely agreed that we must thoroughly coordinate with each other and with South Korea, and cooperate closely with the international community to increase pressure on North Korea and make it change its policies", Mr Abe told reporters at his official residence on Sunday morning. Mr Abe spoke with Mr Trump on Saturday - the third conversation between the two leaders since North Korea launched a ballistic missile over northern Japan on Tuesday. The Japanese leader said he discussed with Mr Trump the shared analysis of "the latest information on North Korea and how we will respond", Kyodo News reported. There was no indication from the Japanese leader that another North Korean nuclear test was imminent. A second zero kilometre deep earthquake has been detected by Chinese authorities, official Chinese media media said. The People’s Daily said the second quake was magnitude 4.6, and happened “minutes after” the magnitude 6.3 quake. Japanese Prime Minister Shinzo Abe said a sixth nuclear test by Pyongyang would be "absolutely unacceptable," after a 6.3 magnitude explosion in the North indicated a new detonation. "If it forcibly conducted a nuclear test, it's absolutely unacceptable. We have to strongly protest it," Abe said. "There is a possibility that this is not a natural quake and that North Korea conducted a nuclear test," he said, adding that the Japanese weather agency detected a seismic wave. The US Geological Survey said it had recorded a magnitude 6.3 earthquake, after initially assessing it to be 5.1. A 6.3 magnitude quake would be ten times as powerful as the one triggered by the North’s September 2016 nuclear test, which triggered a 5.3 strength earthquake, and had an estimated yield of about 10 kilotons. According to Jeffrey Lewis, Director of the East Asia non-proliferation programme at the Middlebury Institute of International Studies in California, a magnitude 6.3 explosion would likely mean an explosive power of around a megaton. “That would be a staged thermonuclear weapon,” he said on Twitter. Julian Ryallin Tokyo has the latest from Seoul. "South Korea has ordered all its military forces to a state of high alert, according to Yonhap news, with Seoul's Joint Chiefs of Staff announcing that the magnitude 5.6 "artificial earthquake" recorded in North Korea at around 12:20 local time is "presumed" to have been an underground nuclear test." Seoul is scrambling to get information about the explosion. The country's national security council is meeting. Agreement was reached between Donald Trump and his South Korean counterpart, President Moon Jae-in as Washington sought to boost South Korea's ability to defend itself against its northern neighbour. A strong shallow earthquake struck the Democratic People's Republic of Korea (DPRK) on Sunday, triggering suspicions that it might be caused by explosion. In its latest update, the U.S. Geological Survey reported that the tremor happened at 0330 GMT and measured 6.3 magnitude, with an epicenter 24 km east-northeast of Sungjibaegam and zero km deep.The institution noted that it might be caused by explosion and that its epicenter was located near the site where the DPRK detonated nuclear explosions in the past.The China Earthquake Networks Center also placed the magnitude at 6.3 and the depth of its epicenter at zero km, and noted that explosion was suspected. In the wake of the earthquake, South Korean President Moon Jae-in called an emergency meeting of the National Security Council. South Korea's military says the 5.6 quake in North Korea was artificial, and is analysing if it was a nuclear test.